During the past several months Rebecca and I have been working behind the scenes to facilitate screenings of Food For Change at 32 co-ops in 17 states. 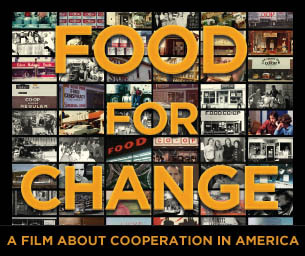 Tomorrow I'm heading to the Florida Panhandle, Pensacola and Tallahassee then to the Pacific Northwest— Seattle, Port Townsend, Everett, and Bellingham— to present the film and talk about the current growth of food co-ops in the historical context of the cooperative movement in the U.S. The goal is to provide Education and Training for co-op members, elected representatives, managers, and employees so they can contribute effectively to the development of their cooperatives. We also want to reach the general public, particularly young people and opinion leaders, with an understanding of the nature and benefits of cooperatives. We will need your help to do this! Achieving this goal will require Cooperation among Cooperatives with us serving as facilitators and a support system to connect with local, national, and regional structures. Please read the Outreach & Distribution Plan to understand how we can expand the impact of cooperatives through education. I made Food For Change because I believe co-ops are a time-tested model that brings vitality to local communities while thwarting the power of monopoly-capitalism. Now is the time to bring our Cooperative Principles into the national conversation! Please see Outreach & Distribution Plan for the complete budget. "Wow! I just finished the movie and I must say, that was incredible! I've been working on our start-up for the last 2 1/2 years and this is incredibly encouraging! This film is truly one of the most inspiring films I have seen. My heartfelt congratulations to you and your crew for a wonderful film." If you've read this far you're entitled to a little gift. So here are the opening scenes of Food For Change. Enjoy & Spread the Word! Copyright © 2013 Home Planet Pictures, All rights reserved. Our 501(c)(3) Fiscal Agent is the Pocumtuck Valley Memorial Association.